I cheated at Bethpage Black. Those of you who know me well know that if I am nothing else I am a die hard purist follower of the rules of golf. 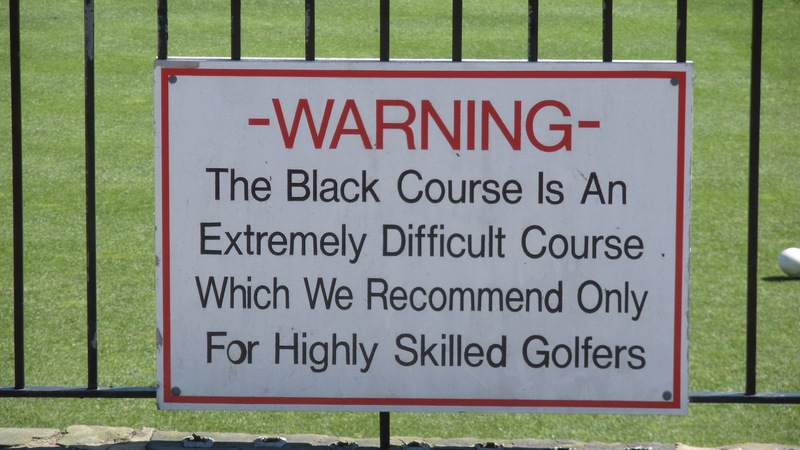 It is true though, I played the Black Course at Bethpage State Park and I cheated. As anyone who followed the stories about the U.S. Open’s groundbreaking visit to this municipal golf course knows, the only way to get on Bethpage’s Black Course is to park in a numbered spot and sleep in your car the night before you want to play. At about 4:30AM each morning tee times are distributed to the overnight campers and that is how golfers get on Bethpage’s Black Course. It’s the local rule. While I was researching this course last year I discovered something that is common knowledge among residents of New York state, but not so common knowledge to non-residents. A resident of New York state is able to book a tee time using the automated phone system 7 days prior to the day they want to play. I wanted to play the Black on 8/3 so on 7/27 at 7PM I was smiling and dialing. At 7:05 I made it into the system and using my a friend Jay’s New York drivers license number I booked a tee time for Sunday 8/3 at 10:36am. So there you have it. I cheated at getting on at Bethpage Black. I did not drink beer and grill out in the numbered spots in the parking lot and I did not sleep in my car. Hell, I didnt even SEE the numbered spots in the parking lot. As far as I was concerned if I was going to spend a 6 hour round waiting to play shots on the Black, I didn’t need to spend the 12 preceding hours waiting in a parking lot to do so. I cheated and I don’t even feel bad about it. 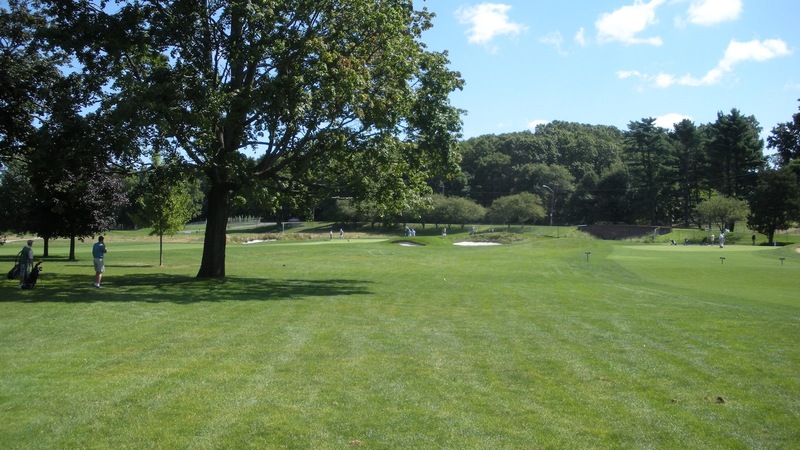 The Black Course at Bethpage State Park is yet another A.W. 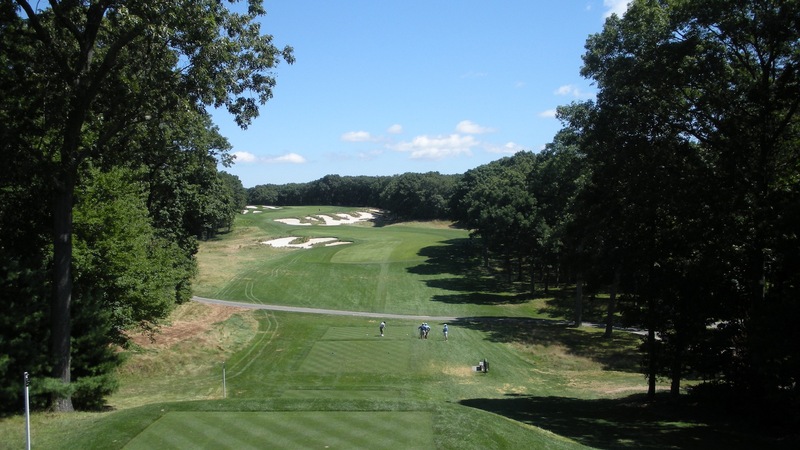 Tillinghast design and yet another U.S. Open course. There is much debate about how much of the course was designed by Tillinghast and how much was done by Joesph Burbeck, the long time superintendent for the golf facility at Bethpage. I won’t go into the details of the debate here, but if you want to read more just do a Google search on Joseph Burbeck. When the U.S. Open was held at the Black in 2002 it was the first municipal golf facility to host the event. It was a huge success that year and Tiger Woods won with a score of 3 under par. The U.S. Open will be back at the Black next year in 2009 and it will no doubt be another great championship providing the usual mix of drama and tragedy for the players. Because the Black Course is owned by the state of New York it is a public access course which means that they run A LOT of golfers through the course each day. Also because the course is SO long, SO difficult and prohibits golf carts, the rounds can be excruciatingly long. We were told to expect a 6 hour round and that is was we were mentally prepared for. Incidentally, if you follow the traditional color coding of tee markers the ladies’ tees (red) here play 6200 yards and the regular men’s tees (white) are 6700. The championship tees (blue) play a whopping 7,468. Yikes! As I mentioned above I booked the tee time using my good friend Jay’s resident status. The NY resident who books the tee time must be playing in your group so don’t go getting any ideas that you can use your Great Aunt Hazel’s drivers license number to get a tee time at the Black. If you do so you had better have your Great Aunt Hazel with you when you check in and she better be able to walk the course. We were booked as a 3 ball so there was great speculation between the 3 of us as to whom our 4th player would be. You just never know what kind of person you will be paired up with at a public play facility on Long Island. I was hoping for a Long Island native that would give us a little local flavor. On to the course. The battery on my camera died on the 3rd hole, so there are not many photos to post. 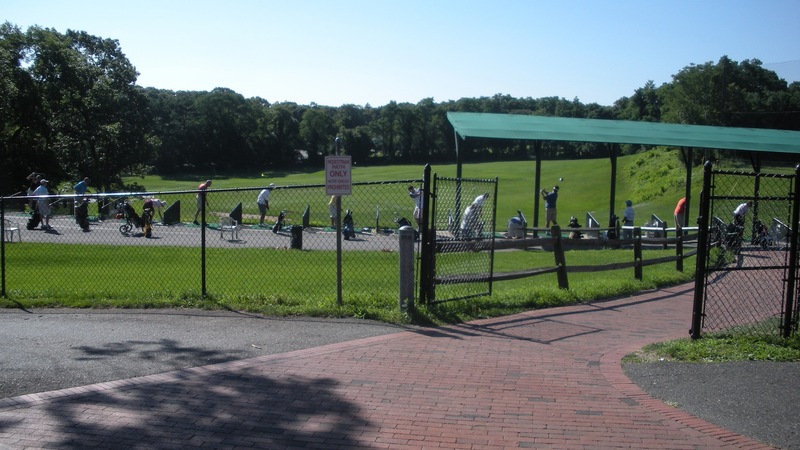 Below is a picture of the driving range for the Bethpage golf facility. You could say it’s a little different from the typical pyramids of Titleists stacked on the grass that I have encountered on most of my Top 100 excursions. I liked the feel of it though. It reminded me of going to the range where I grew up in Omaha. At the Bethpage range we saw everything from guys who looked like they stepped out of the clubhouse at Augusta to guys with muscle shirts that were not tucked into their shorts. It was quite an interesting scene. Of course I have to post the photo of the famous sign that presides ominously over the first tee at the Black course. ‘Highly skilled golfers’ . . . we didn’t let that stop us! Below is a look from where my ball sat after my drive on the first hole. An interesting thing to note is that the fairway and green you see on the right is the fairway and green for the 1st hole on the Green Course. The shortest route from the tee to the green on the Black Course’s 1st hole is to hit your drive way right into the fairway on the Green Course’s 1st hole and then have a nice mid iron into the Blacks first green. During the US Open this Green fairway is staked with white Out of Bounds markers to keep the pros from doing this. I hit a pretty poor slice off the tee and ended up in the rough with just 160 yards in on a 429 yard hole. Not bad for a mishit. The photo below is a look from the US Open tee box of the 4th hole. This is a great par 5. A well positioned drive will carry the bunkers on the left and be in the ‘go zone’ for reaching the green in 2. After hitting my 2nd shot fat I made a miraculous shot out of the 2nd set of bunkers to get on the green in 3 and 2 putt for my par. I wont bore you with any more shot by shot analysis of my game. That’s the end for my photos which is a shame because this course is so visually intimidating off the tee that there were many great photo ops. The forced carries on The Black are numerous and each one very long. I’ve never played a course where I hit a perfect tee shot and immediately after it left my club started praying that it was going to make the carry. The rough was also particularly long. Having just hosted the NY State Open the course was set up for tournament play. I missed the first green and my ball was so buried in rough that my first attempt to pitch it onto the green resulted in moving the ball about 2 inches. The rough was brutal all day long. Another thing I will note about this course is that the greens leave a lot to be desired. Many of them are as flat as pancakes and not difficult to putt at all. The 2nd green was like putting on a tabletop! I suppose that if you put the Tillinghast greens from Winged Foot’s West Course on this course you would turn a 6 hour round into an 8 hour round as guys toiled over their 4 foot breaking putts all day. Incidentally we made it around in five and a half hours despite being double stacked on a couple of tee boxes. It was long, but not quite as bad as we expected. You will want to make sure you are in good shape when you get to the Black. If you are not used to walking make sure you warm up with a couple of walking rounds prior to playing here. The scale of this course is huge. The holes look huge, the course feels huges and when you finish you may not be sure if you just played a round of golf or ran a cross country half marathon. Having a caddie here is highly recommended. You can hire them through the pro shop if you book a tee time in advance. It was $40 per bag plus tip which I thought was very reasonable. If you are not playing with a NY state resident and are sleeping in your car you will have to hire one of the non-affiliated caddies that hang around the facility. I’ve not heard great things about them, so beware. Several people went so far as to tell me that they would rather carry their own bag or have a pull cart than one of the non-affiliated caddies. They are more than double the cost and apparently can be quite suspect. Proceed with caution if you elect to go this route. Our caddie, Sean, who we got through the pro shop had more hustle than any caddie that I have ever had at any course. He was always there within seconds of me reaching my ball and at times I actually saw him running with both bags slung over his shoulder. If hard work were money this kid would be Bill Gates. Simply put, he was great. Tee to green The Black has turned out to be one of my favorites that I have played so far, but the putting surfaces themselves were more than underwhelming. While they were well maintained, they were for the most part the flat circles you would expect of a municipal golf course. Of course the easy greens help a notoriously bad putter like me and I had a great day on the course for scoring playing several strokes below my handicap. The Black is well worth playing and to be able to play a U.S. Open course for a mere $120 it is a no-brainer. Find a NY resident to play with you though . . . it’s the only cheating in golf you’ll feel good about. i am aregular caddie on the black course and to read your account of the greens as flat circles is totally not accurite. they are very true and very suttle as was intended by the designer. this course is very difficult from tee to green it is only there that you can relax lf you are adecent putter. also if you play again and want a good fulltime caddy email me in advance. we have a new program for caddies now, no more soliciting in front of the clubhouse. the pro shop handles all caddies and yes we still have afew bad ones but we are striving to eliminate them as we now require a player review sheet when you are done playing. i hope this update reaches you soon so you can spread the word. look foreward to meeting you someday. Charlie C . . . Doubt It. Hav u ever seen any of tillies greens on his other courses. bethpages ones were designed for muni golf. The photo showing the author’s second shot into the first green is incorrectly identified on the web as the view from the tee box on the fourth hole. They must have misidentified the photo based on the text following the picture. Re: the greens at the Black. The comments are completely off base. No doubt the idea of “flat circles” is completely inaccurate especially regarding holes 4, 6, 7, 8*, 10*, 11**, 12, 14*, 15**, 16, 17 and 18. The asterisk holes deserve SERIOUS concentration. I watched Davis Love III three putt No.10 from 10 ft. I have, more than once, watched a 3 footer from above the hole on #11 roll 10 feet past. Rolling a “horseshoe” (up and around the hole and back to the player) is a serious risk at #11 if the greens are baked and the hole placement is particularly sadistic. Perhaps on a second viewing the author would get past the “tee to green” length challenge and recognize the difficulty Tilly built into these greens. Definitely have Friar’s Head on my radar. Might be 2014 before I get back to Long Island, but I definitely plan to get there at some point.